The wing really is elliptical and it flies! Little wingtip vortices improves performance 30%. Structurally more sound than conventional designs. Made for civilian usage where there is little. I thought I’d never see something like this again. 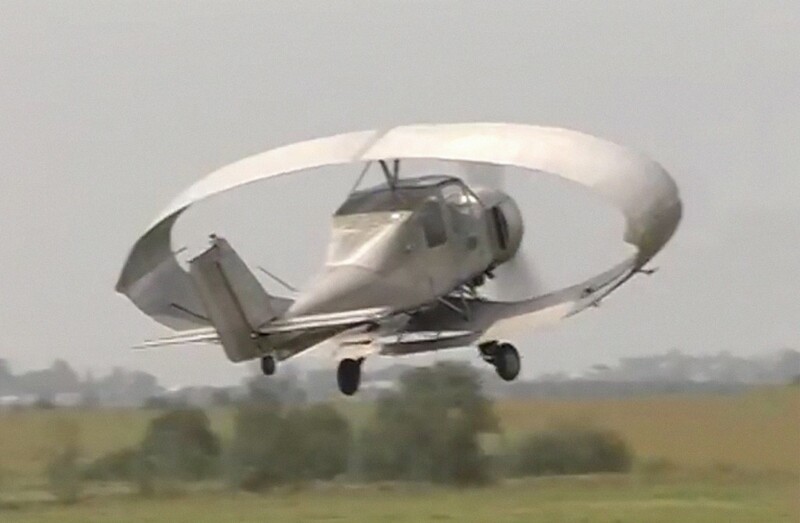 That oval or closed elliptical wing design is easy to recognize, if somewhat unconventional. I remember seeing photos of this aircraft a while back and if memory sserves me right it was an Eastern Block design, Belarus maybe. Don’t remember much about it, name, manufacturer, numbers produced, etc. But I remember hitting the books to find out more about the efficiency of such wing design and decided the aerodynamic data was best reserved for aeronautical engineers. So far, no correct answers, though one of the above is close. I will have to leave it to someone else to translate! The paper, NASA CR 172529, ‘Aerodynamic-Structural Study of Canard Wing, Dual Wing and Conventional Wing Systems for General Aviation Applications’, by Bruce P Selber and Ronald L Cronin, deals with something similar.